Jane and Steve Beshear -- Kentucky's First Pair -- hosted a Kentucky Proud Dinner at the Governor's Mansion in Frankfort last night. The intention: Demonstrate the ways Kentucky's food and drinks can delight our palates, improve our health, and build economic wealth for our farms and communities. Particular intention: Encourage large Kentucky institutions and corporations, particularly colleges and universities, to step into leadership roles as accelerators of a Kentucky Proud economic and health transformation. This future is Kentucky's own and it is near enough to taste, literally. Look at this beautiful menu, and the contributors who supported the gathering. Unlike economic development templates imported from other states, with their frustrating lack of fit with who we are and what we can produce sustainably, this earthy vision for our beloved Commonwealth's vitality is grounded directly in our world-class growers, land, water, climate, and culture. Since our culture is what we use to look at the world, seeing that culture ourselves can be as hard as looking directly into our own eyes. We can try, though. I describe Kentuckians to others as kind, cheerful, funny, smart, practical, energetic, self-reliant, hospitable, and unpretentious. A powerful Kentucky change agent told me that although Kentuckians have a reputation for being conservative, he thinks of us primarily as balanced and moderate, unwilling to be pulled off-center by fashion, fads, fears, or fantasies. Somehow the Governor's Kentucky Proud dinner reflected a Kentucky pure spirit that satisfied soul as well as body. Begin with the setting -- a beautiful big Kentucky home flanked by beds of black-eyed Susans, spider flower, and deep blue salvia. Our Governor's Mansion is grand enough to function as the Commonwealth's formal clubhouse -- and, as the Governor noted, as "public housing" for his family -- yet the scale is human and the tone is warm, inviting. Our crowd of agriculture, education, corporate, and community leaders dressed up, but not so much that we couldn't enjoy ourselves. The food -- beautifully grown, prepared, and presented -- delighted without tipping into excess. The certified organic beef was brisket, not filet; the chicken was stretched with grains and savory tidbits in a delicious cold salad. The legendary legion of great Kentucky home cooks could have picked up usable tips from the preparations, and then delivered delicious versions of each dish at home without undue expense or unusual technique. More than anything, I appreciated that even the fantastic food was not the main point. The dinner had a practical purpose. Jane and Steve Beshear, and Kentucky's agricultural leaders, chose to show, and not just tell, what Kentucky can produce, so more individuals, families, businesses, and institutions will form new habits of eating Kentucky's bounty. For individuals: Eat at least one locally produced food each day for 30 days. For families: Cook and eat at least one Kentucky-sourced meal each week for 30 days. For corporations and institutions (I am a little fuzzy on this one): Introduce at least one Kentucky food item to employees, students, clients, or board members each week for 30 days. Jane Beshear opened the Kentucky Proud dinner with a direct, clear, passionate Kentucky Proud call for everyone present to eat Kentucky's fine local foods and reap a bountiful harvest of good tastes, improved health, and economic benefits to families, communities, and the Commonwealth. I found my heart and spirit rising as I realized how deeply Jane Beshear is invested in this beneficial work, and how many ways her gifts and skills serve our Commonwealth. Steve Wilson, co-founder of Kentucky Bison Company, offered a toast near the end of the dinner, thanking Jane Beshear for her leadership, and nominating her as champion of Kentucky's local foods initiatives, a "position" that has gone unfilled until now. Jane Beshear's investment in the Kentucky's Governor's Garden has already yielded successes for all involved. The Governor's Garden at Berry Hill Mansion has just gone into syndication -- courtesy of Kentucky's fantastic network of Cooperative Extension Offices. Expect homegrown versions of the Governor's Garden to sprout like spring radishes in counties across the Commonwealth. Jane Beshear had the first words, and Steve Beshear had the last words at the dinner. He called on all of us to invest in Kentucky's local food economy, to fuel the economic generator that will power our state to unprecedented health. 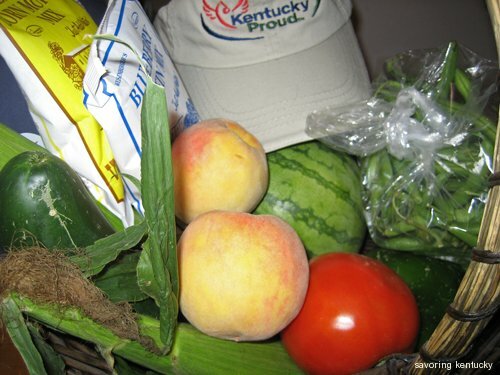 To underscore Governor Beshear's charge, a fact sheet included in each diner's food basket makes this point: If every household in Kentucky spent just $12.00 per week on local farm foods for eight weeks, nearly $159 Million would go directly to Kentucky farms. Then it would multiply through our farm communities. Take that, budget deficit! The fact sheet was the final precious tidbit in in a memorably tasty Kentucky evening. Watching as institutions and individuals all through Kentucky take the 30 day challenge -- that will be the sweetest finish of all.